Birgit Meyer studied business administration with a focus on HR management and has been working in HR consulting for a number of years. At Iventa, she was a senior consultant before entering into maternity leave. She supported national search and selection projects for management and specialist positions. After that she was responsable for executive research projects. 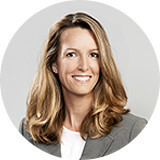 Birgit Meyer brings in her gained experience in marketing now.